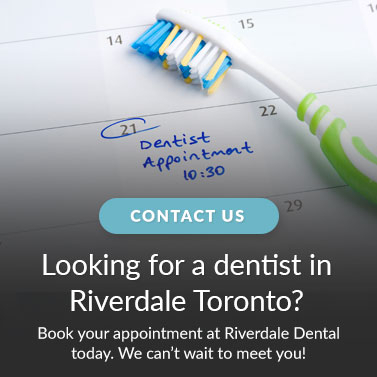 At Riverdale Dental in Toronto, we understand the importance of maintaining a strong and proper dental hygiene and prevention routine. The purpose of this is to help you keep your teeth and gums healthy today and every day, eliminating the occurrence of gum disease and tooth decay. The two primary causes of tooth loss: decay and gum disease. Decay and gum disease are caused by bacteria in the mouth. Both of these problems can be dramatically minimized, if not prevented, through proper dental hygiene. Our professional dental team in Toronto will help you learn more about proper brushing and flossing, gum disease, tooth decay, and the relationship between these properties.